Our home is truly a haven in the pines, surrounded by beautiful snow capped mountains and wonderful recreational offerings. The house is set back in the pines off a quiet lane (Fleabane) which connects to the main road (Ponderosa) that leads to the Glaze Meadow Golf Shop three blocks away. It overlooks the 7th fairway and is approximately two blocks walking distance from the newly built Glaze Meadow Recreation Complex. Features of the complex include: indoor, outdoor and toddler pools, exercise facility, children's water play area, spa, sauna, snack bar, and tennis shop. Tennis courts and a children's rock climbing and play area are adjacent to the complex. A WONDERFUL PLACE TO GATHER! We recently remodeled, refurbished and added space to our 2400 sq. ft. home with friend and family gatherings in mind. Our home is light and airy, with a full wall of windows overlooking the golf course in the living, dining and breakfast areas and has an open floor plan. The living/dining area has vaulted ceilings with a lava rock wall and raised hearth fireplace. The kitchen has plenty of counter space and an island bar area and breakfast nook. It has 2 Sub-Zero refrigerators (one refirgerator only and one side by side), 2 dishwashers, double ovens, and all that you need to prepare, cook and serve your group with ease. The deck faces east and surrounds the golf course side of the house. It is the perfect place to spend balmy summer evenings and has a gas barbeque, table and lounge seating and a private hot tub. A second generation of children is now enjoying the mini basketball hoop and ping-pong table in the finished garage. The main floor master bedroom has a king size bed and doors opening to the deck and hot tub. Two additional bedrooms have queen beds and a fourth has a bunk set and single bed. The bonus room also has a bunk set and a trundle bed. There are three tiled full baths. THE RANCH: UNMATCHED BEAUTY AND RECREATION! Black Butte Ranch is a unique resort nestled in a Ponderosa pine, fir, and aspen forest and is surrounded by seven snowcapped, majestic Cascade mountain peaks. It is tranquil and non-commercialized, yet offers a full spectrum of resort amenities. It is a working ranch where cattle and horses graze in the centrally located mountain meadow. This gated community has 2 championship golf courses, five swimming pools, 23 plexi-paved tennis courts, 18 miles of bike/walking trails, canoing, cross country skiing, catch and release fly fishing, guided horseback riding, volleyball courts, basket ball hoops and soccer and softball fields. The recreation department offers activities for all ages and will happily assist with information about recreation available in Central Oregon. Mt Bachellor and Hoo Doo ski areas, numerous lakes, rivers, hiking trails, rock climbing and wilderness areas, and snowmobile parks are an easy drive from Black Butte Ranch. Three restaurants on the property provide poolside, casual, or fine dining. There are snack bars at the golf shops and Glaze Meadow complex and there is a 'General Store' for quick shopping needs. Black Butte has it's own fire department and emergency medical services. The western themed town of Sisters is seven miles away with a wide array of boutiques, small stores, bakeries, restaurants, a health and fitness center, a nice super market and a new movie theater. Should you want larger city amenities, Bend is about 30 minutes away. 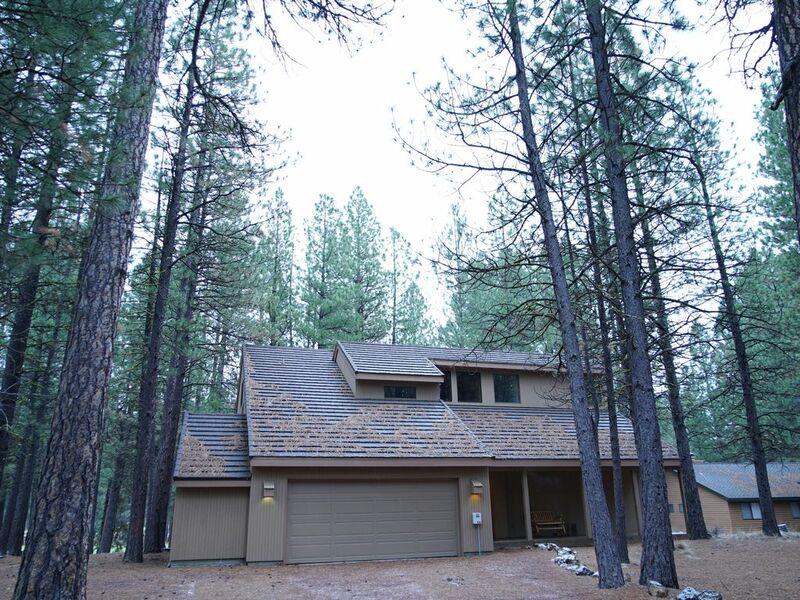 COME AND ENJOY THE RENEWING SERENITY, BEAUTY AND RECREATIONAL OPPORTUNITIES AWAITING YOU AT BLACK BUTTE RANCH! ACCEPTING RESERVATIONS FOR 2015 AFTER JANUARY 1ST. Each bath has a shower tub combination and is tiled. The king bedroom and one of the queen bedrooms has a private access door to a bathroom. These baths also have a public access door. The third bath is adjacent to a queen bedroom on a separate balcony hallway. Located on the Glaze Meadow course 7th fairway. Drivewat can accommodate 4-5 cars. Sofa , Love seat, chair, cushions, television, fireplace. beautiful view of golf course. The kitchen is fully equipped with enough dishes, table ware bakeware, pots and pans to accommodate large groups. There is also a full sized griddle, standing mixer, and crockpot. Garage has a ping pong table and mini basketball hoop. A few DVD's are available. Large wrap around deck with tables and chairs, chaise lounges, and private hot tub. We are about a block and a half from the Glaze Meadow Recreation Center with indoor/outdoor pools, sauna, spa, fitness room , snack bar, sport shop, bicycle rental and more. Nice house in a great location, plenty of room for 3 families with kids. The garage/gameroom was great. The kitchen was well stocked with everything we needed, some of it was a little beat up but we didn't have any problems. Overall we were very happy with our stay. messages from the property owner did not reach us, we couldn't reach VRBO, etc. We'll avoid VRBO in the future. Tony, Thank you for your very nice review of our house. I'm glad you enjoyed your stay and appreciate your taking the time to write this review. I stayed in house in the winter with 2 families with kids ranging from 3-7. House is well suited for this. The kitchen is HUGE and very well stocked with dishes and utensils. The garage has been made into a "playroom" and was a bit hit with the kids. It has a basketball hoop, tons of balls, various tricycles, and a scooter, and also a ping-pong table that can be set-up. There are great forest views from the main room, it was perfect for us to all be together visiting, playing, and dining while watching the snow fall amongst the trees. We would definitely stay there again! Dear Carolyn, thank you for your positive review of our Black Butte home. We appreciate your comments and enjoy providing a relaxing, family oriented home for our renters. We hope you will come again. It was a great beautiful house! The house was perfect for the amount of people we had. Very spacious and kitchen great for graduation party's. We would stay there again for sure!!!! Our family rented this home during January and it was a fabulous location for us. We were a short walk from the rec center for swimming, play area for kids and many other activities. The home was perfect for a large group with an amazing kitchen that had everything we needed for cooking for a large group. There was plenty of space for all of us and the bedrooms were set up nicely for several couples. We have rented several places at Black Butte over the years but I think we have finally found the one that works best for us. We will definitely be returning! A holding deposit of $500 is due at booking. The balance of fees may be paid in 2 equal payments at 90 days and 45 days prior to occupancy. Cancellation information is in the rental agreement. When stays are three nights or under payment of 50% will be due at booking and 50% will be due 30 days prior to occupancy.